"Just don't go postal, Fletcher." — Hard Reset trailer . He probably won't listen. Hard Reset is a PC-exclusive First-Person Shooter from developer Flying Wild Hog, released on September 13, 2011. The game is a modern take on classic shooters, emphasizing old-school elements such as health pickups, carrying lots of guns at once (well, sort of), and fast-paced action and movement. The game takes place in the year 2436. Humanity has been nearly wiped out by rogue robots, and the last safe haven of humanity, the city of Bezoar, has been breached. The player assumes the role of Maj. Fletcher, of the city's security corporation, CLN. The game originally came out short and with No Ending, but the developers remedied by releasing Exile, a free DLC that completes the game, and the Extended Edition including both the base game and the DLC has become the "regular" one. 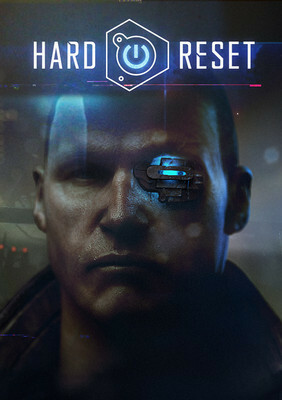 In 2016, the game got a Updated Re Release as Hard Reset Redux. Action Bomb: The Savage, a beachball-sized sphere-on-legs that basically charges at you and explodes. A.I. Is a Crapshoot: At least two cases, with a probable third in the making. Anti-Hero: Fletcher isn't exactly a nice person. Apocalypse How: Humanity created an AI that went rogue. At first it looked like they had the upper hand, but now they're bottled up inside Bezoar City. Artistic License  Physics: A very large license. A particularly obvious example is probably... using the Shotgun Secondary Fire on a charging Gorilla will make it freeze, completely cancelling any momentum it might have had. Doesn't stop them from completing a Shockwave Stomp though. Attack of the 50-Foot Whatever: Atlas and the Constructor, pretty much. The former being a statue and the latter some kind of rampaging construction/maintenance mecha built by the AI. The Overseer, a large bipedal robot fought at the end of Exile is a aversion, since he isn't even half the size of the previous two bosses. Beehive Barrier: The Electric Mortar's Stasis Field makes a spherical Beehive Barrier which freezes enemies caught inside it. They're still vulnerable to your attacks, though. Bottomless Magazines: Though you don't have infinite ammo, you never have to reload. The Sanctuary is a network containing billions of digitized human consciousnesses. Of course, it's the machines' primary objective. They want to absorb the conciousnesses to advance past their limits. Fletcher can also upload the brains of other people into his own head to learn what they know, amongst other things; exactly what is never specified. He drinks heavily to drown out the 'voices' of the assimilated personalities. The Chessmaster: Professor Novak is clearly engineering things on a pretty grand scale here. City Noir: Bezoar City is a vast, towering City Noir. When we say towering, we damn well mean it too; at certain points the wind whistles by fast enough to suggest you are a very... appreciable distance from the ground that you most definitely can't see. Yet, when you look up? There's still a lot more city to go. Cluster F-Bomb: Major Fletcher seems loving this trope. Color-Coded for Your Convenience: Anything in the environment that can explode will be a bright orange-ish red, and anything that can create large arcs of electricity is cyan. Very obvious on pick-ups (green = health, red = CLN ammo, cyan = NRG ammo, orange NANO, also the numbers in the HUD). Combos: Using your weapons and their various modes in tandem with each other and the environment is key to quickly wiping out the resident Smash Mooks or a Zerg Rush quickly and efficiently. Charged Attack: The Secondary Fire mode of the plasma rifle. Cyber Punk: With a large portion of Used Future too. Cyber Punk With A Chance Of Rain: it doesn't rain the whole time...but it does rain. Defector from Decadence: In "Exile", Fletcher turns against CLN after he realizes their role in the robot uprising, and the bulk of the expansions is his former comrades trying to kill him before he can reach Haven and expose them. Deflector Shields: Fletcher possesses a Personal Shield that, like Unreal, partially reduces incoming damage but loses effectiveness as it depletes. It requires a few seconds of you not taking damage before it starts recharging itself. It can be upgraded to recharge faster, reduce the delay before recharging, and increase maximum capacity. Electronic Eye: Fletcher has a metal implant covering his left eye. EMP: The shock blaster can send out a paralyzing electromagnetic pulse with its Secondary Fire, and the shotgun can fire EMP stun darts for a similar effect. Enemy Scan: A passive function of the NRG Weapon's Seeker mode reveals the name and health of the currently targeted enemy, plus some delightfully useless charts that are just there to look cool. Excuse Plot: It seems like the story for this game was added very late in the development process, although the comic panels it's told in are nice. You see, nanites were somehow put into a statue, and they're trying to... get to an abandoned hospital? Yeah. Exploding Barrels: Plenty of them, and, considering how many secret areas they open up, you'll be shooting lots of them. Not just barrels, either. Fletcher can wreck all manner of blue (electrical) or orange (explosive) terrain items to get an edge on his opponents, creating temporary area denial effects with streams of electricity, or simply blowing up everything nearby. Flunky Boss: All of the Bosses. Healing Checkpoint: The soft variety—most checkpoints are right next to jumbo-size health packs. Homing Projectile: Fired by the smartgun. Not only do they home in on enemies, they also travel through walls. Laser Sight: An upgrade for the rocket launcher. Layered Metropolis: Bezoar City is a vast, towering Cyber Punk example of this. As Yahtzee pointed out: "There's one level where you're in a subway station and a few corridors later you're on a rooftop!" They did sort of hint at it with how tall Bezoar is implied to be, at certain points the wind whistles by fast enough to suggest you are a very... appreciable distance from the ground that you most definitely can't see. Yet, when you look up? There's still a lot more city to go. Seems pretty likely that with it being that tall and this trope what it is, the designers would layer the city. Lightning Gun: The NRG's shock blaster. Mad Scientist: Professor Percival Novak. He made the Interior AI, and is responsible for the 'condition' that Fletcher suffers from... which could well be The Plan. Mecha-Mooks: Do you like shooting robots? Because this game has lots of them. More Dakka: The basic modes of the CLN firearm and NRG weapon are designed to fire lots of shots in a short amount of time (although the plasma version has a Charged Shot mode too). My Death Is Just the Beginning: Novak's plan has some shades of this going on, although it's not exactly the first step. New Game+: Ex Mode. Beat the game once, start over again on any difficulty with all the stuff you had before! Very useful for higher difficulties, where your ability to fight effectively is reliant on the weapon modes you have at your disposal. No Ending: After a (enjoyable) boss fight without any story significance, the game just... stops. Amended by the free Exile pack but only partly - the true ending has Fletcher reaching Haven and departing with a survivor from there he's just met, and cue ending credits, so it's all Left Hanging. Notice This: Important environmental features like switches will glow. Pickups glow as well. Only in It for the Money: Fletcher claims this is his only reason for working for the CLN. Overheating: Whilst the standard CLN Firearm can't overheat in the usual sense of this trope, prolonged firing does cause it to glow red with heat, as a rather nice touch. Playable Menu: Zig-Zagged with the upgrade terminals. You control Fletcher...while he navigates a point-and-click menu. Point Build System: Used for upgrades. You get one point every time you level up, and you get to choose where to put it. Power-Up: Health and Ammo, plus NANO. Health is green, CLN ammo is red, NRG ammo is blue, and NANO is orange. Pick up enough NANO and you can buy a permanent upgrade for your weapons and kit at an Upgrade Terminal. You also get a varying amount of NANO for every kill depending on the enemy. Precision F-Strike: From the trailer, Fletcher's response to his Mission Control when he is initially denied a request for backup. Pun: N.R.G. weapons. Say it out loud. Recursive Ammo: The RPG can be upgraded to fire cluster bombs, dropping an extra three explosions on the target. Secondary Fire: Most weapons have one. The ones that don't use it to activate a scope. Short-Range Shotgun: The shotgun is a short-range Area of Effect weapon with a secondary mode that fires paralyzing darts. Sir Swears-a-Lot: Fletcher is the only foul-mouthed character of the entire game. Smash Mook: Gorillas. They love Knockback, and they have two attacks: either they charge at you like a bull, or they use a Shockwave Stomp. Sniper Rifle: The railgun, with its deadly accuracy and x-ray scope, functions as one of these. Spiritual Successor: In case you couldn't tell, most of the people that formed Wild Hog previously worked for People Can Fly. Standard FPS Guns: All of the CLN weapons are classics: rapid-fire assault rifle, Short-Range Shotgun, Grenade Launcher, rocket launcher, and Sticky Bomb. The NRG weapons are less standard, but still include a Charged Attack, a Lightning Gun, a Rail Gun, and Homing Projectile. Suspicious Video Game Generosity: Hey, why does this large, open area have so many health and ammo pickups everywhere? Aaaand cue Boss Fight. Swiss Army Gun: You carry two weapons: a ballistic weapon, and an energy weapon. Each of these can be upgraded to use up to five separate modes of operation; each of those modes has a standard mode and can be upgraded to have a new Secondary Fire mode. Wreaking Havok: As the game incorporates Havok, this should hardly be a surprise. Barrels will fly everywhere, as will bodies and debris. Wretched Hive: From what little we can gather about Bezoar, it is this. The city is run by corrupt mega-corps, everyone seems to be addicted to one thing or another, the sun is blotted out by rampant construction, and you are harassed by talking vending machines with adverts for Expendable Clone services and prostitution whenever you walk down the street. Zerg Rush: Expect to be positively swarmed by enemies later on.